We are proud to say that *EverGlow* completed three years this month. And, to celebrate, we’re having a sale!! 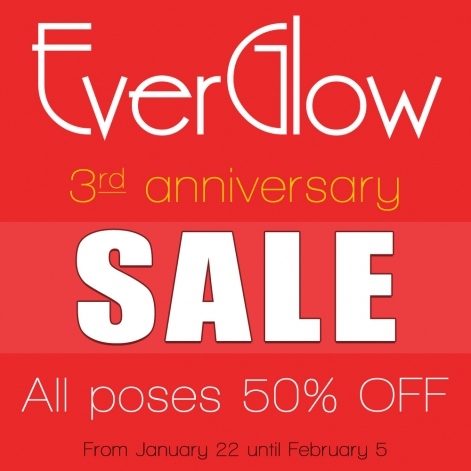 50% OFF in all poses! We have couple poses, male poses and female poses!! The sale will last from January 22 until February 5! Shop early, and don’t miss this chance! Dieser Beitrag wurde unter bloggies from Sawa, Sales abgelegt und mit Everglow, Fanny Willis, Pose, Poses, sale verschlagwortet. Setze ein Lesezeichen auf den Permalink.